Is a Confessor's power really all that reliable? Yes, as reliable as using 1/2 of a tool for finding the truth. In Legend of the Seeker Kahlan has to face the limitations of her confessors abilities to discover the truth in the episode Confession. We the audience, get to see those limitations in further detail the episode Sacrifice. The confessed fall totally in love with the confessor they will tell them what they believe is the truth. Very effective as long as what they believe is true. Terry Goodkind is very good at exploring the issue of truth. Perspective is one of the brilliant things brought forth. If someone believes something to be true it is for them. This is the Wizards first rule that Zed teaches us, perception is reality. To counter this fault and finish the Wizards weapon of finding truth they created the Seeker. The Seeker's power is in asking the right questions and taking a direct approach. Kahlan and Richard together make the whole tool for finding the truth. Like a sword where Richard is the point and Kahlan is the blade. The confessors power will allow it's wielder to defeat their opponent in combat by slashing them. Not so effective in very close quarters, nor against plate armor but slashing with the sword is only using 1/2 of the effectiveness of the weapon. The point is what gets used in those other conditions. Where the Confessors power falls short with perspective the Seeker's power is all about asking the questions that reveals one's perspective. So to ask is a Confessors power that reliable the answer is yes so long as you know of its limitations and know what to do to fill in the week points. This is the problems of the lie detector tests. They are not infallible but they will tell you if the person believes what they are saying. The questioner is the other half of the tool being good enough to ask the right questions to understand the perspective and find the truth. 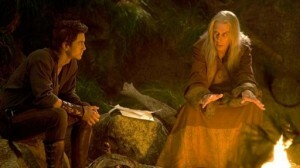 Thanks Legend Of The Seeker.org for pointing out Scifi UK's article.